As many of you know, my partner Midgie and I had a son named Fraser on December of last year. And, it turns out, parenting takes some hours out of your day, and it’s one of the reasons I haven’t posted as much to my website. However, I saw no reason to make a big deal of the important work that Midgie and I were doing, or the fact that I wasn’t writing as much, as I knew that everyone understands that the work of parenting is important. Then I met Catherine Deveny. Rather, I came across an article she wrote for The Guardian entitled, “Sorry, but being a mother is not the most important job in the world.” And the way I came across it was Midgie angrily swearing at Facebook while breastfeeding Fraser. You see, blogger Catherine Deveny claims that women have been too uppity about this motherhood thing. Futhermore, this whole business of you even calling yourself a “mother” is confusing the heck out of the poor blogger for The Guardian. 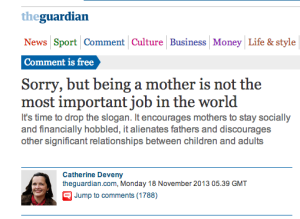 Now, Catherine, a blogger for The Guardian, also makes the claim that fathers are alienated by this language of stating the importance of motherhood, and instead, decided to endear herself to fathers and unalieanate those fathers by minimizing the role of the people they love who have given birth to their offspring. 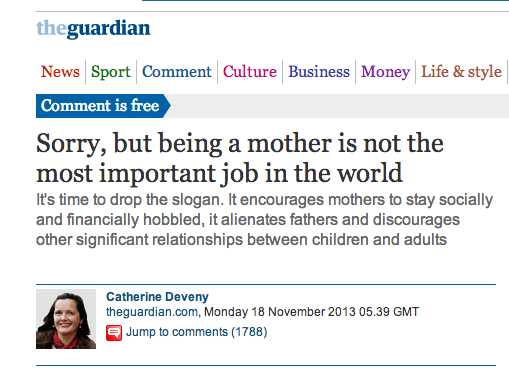 If you’re wondering what authority Catherine Deveny might have to readjust the importance of motherhood, and to tell your wife, lover, and friend to “get over herself”, it’s possible that you’ve already forgotten that Catherine is a writer for the prestigious online website called “The Guardian”, which is very important. And The Guardian published Catherine’s opinion, so therefore, this is clearly a very important opinion that she had. I’m glad that Catherine Deveny was able to clear this up, and set straight what really is important. Because it’s clearly not motherhood. Catherine Deveny says so. And she would know. Because being a blogger for The Guardian is the most important job in the world.